Our territory, between history and nature. Jubilee for the 750th anniversary of the “Miracle of Bolsena.” In town, we strongly suggest a visit to the beautiful basilica of Santa Cristina and the Monaldeschi Castle, current home of the territorial museum. 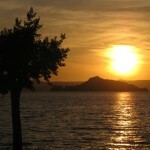 From Bolsena guests can also easily reach the charming village of Capodimonte, from where ferry boats for tours on the lake and the islands depart. Always around the perimeter of the lake are other villages to visit, including San Lorenzo Nuovo and Marta. Continuing in the direction of Viterbo instead, you reach the center of Montefiascone with the beautiful Fortress of the Popes and the church of Santa Margherita. out of time. Very nice are also the landscape that you find around the picturesque valley of the Badlands and the nearby natural park of Lubriano: a journey through the green for nice relaxing walks in the unexploited nature. 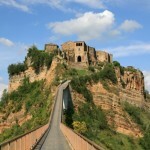 Torre Alfina: another village of the Tuscia area in Lazio who, as Civita, is ranked among the most beautiful in Italy. The entire village is nestled in a verdant countryside, and is dominated by an impressive castle (the Monaldeschi Castle) a beautiful medieval building with high towers and a precious Italian garden. Near the castle there is a “monumental” forest with huge rocks and tall trees, and embedded in this nature is the Gothic mausoleum of the noble Marquis Cahen to whom we owe the construction of the spectacular art nouveau villa (Villa La Selva or Villa Cahen) nestled in the woods of the di Meana forest near the village of Allerona. 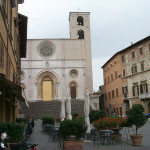 Todi (about half an hour by car). This beautiful Umbrian town can be reached by passing through the area of ​​ Lake Corbara and the Tiber River Park, a protected and very scenic and picturesque environment ideal for lovers of sports like fishing, hiking or mountain biking. In the town of Todi we recommend a visit to the center, with its beautiful Piazza del Popolo, the Duomo, Palazzo dei Priori, and the Roman cisterns. Just outside of town we recommend the majestic Santuario della Consolazione. Near Todi is also the small village of Monte Castello di Vibio, reported among the most beautiful villages of Umbria and where the original “little theater” is. As the name suggests, it is the smallest theater in the world. For those who love nature, below are some recommended hiking trails. brings us back down to the road to Rocca Ripesena (368 m), a small town that looks like a miniature Orvieto. 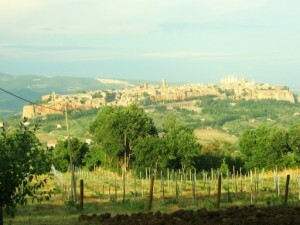 This borough is situated in a panoramic position and rests on a volcanic rock which is believed (as well as other rock called Rocca Sberna) had the same origin of the rock of Orvieto.